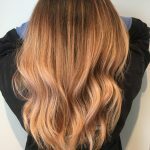 Balayage is a technique that gives natural effects of lightness and depth in the hair. The effect gives a diffused look at the base transitioning to concentrated lightness throughout the mid-lengths and ends while keeping the look very natural. Balayage creates soft movement, however substituting bolder colour (purples, blues, pastels or other bright colours) the end result can look more dramatic. This look has been very popular and trendy for the last decade and has gone through numerous evolutions. It is a great look for a woman that wants to see lightness but also wants a low maintenance look. The word balayage is of French origin meaning “to sweep” or “to paint”. The regrowth appears very seamless due to the fact the lightness doesn’t start right from the root. Traditional highlights give a harder regrowth line with the lightness starting right from the scalp. Ombre and balayage are words often used interchangeably but provide different looks. Ombre is a look that starts with dark roots that becomes dramatically lighter through to the ends. Balayage is a technique that creates an ombre effect but can also work to create a more blended highlight effect or to add subtle lightness in a solid colour. When these looks first became main stream, they were very extreme and it was very visible where the darkness ended and lightness began in the hair. As the trend became more and more popular, the looks became less harsh and the blend between dark and light softened. The lightness slowly became higher and framed the face which gave more of a root look and less drastic contrast. This is when the word balayage became popular since the overall look became softer and more blended. Balayage is not something that can be achieved at home without any professional knowledge. It is a look that takes a lot of time and many problems can arise if you don’t know what you are doing. A balayage service in salon can take 3-4 hours to achieve and requires many steps to achieve that seamless and blended look. Balayage doesn’t require a lot of maintenance, its best to leave it to the professionals for the best experience. Depending on the type of look you are going for, your maintenance can be anywhere between 12-24 weeks. Taz Hair Co. wants you to look and feel your best. If this look is something that you’re interested in, call us to come in and receive a complimentary consultation from one of our talented colourists.